The Pro Bowl is the all-star game of the National Football League (NFL). Since the merger with the rival American Football League (AFL) in 1970, it has been officially called the AFC-NFC Pro Bowl, matching the top players in the American Football Conference (AFC) against those in the National Football Conference (NFC). Currently, players are voted into the Pro Bowl by the coaches, the players themselves, and the fans.The Pro Bowl has been played in Hawaii since 1970 except for 2009 when it was held in Miami. The 2013 game will be held in Hawaii as well and will be played on Jan 27th, 2013, a week before Super Bowl XVII. The logo is in the shape of the Pro Bowl trophy, which is basically the shape of a football. The only non black and white element of the logo is the colorful NFL logo at the bottom of the trophy. Once again, much like the new Super Bowl logo which is black and white and allows little change, I prefer the more colorful logos which changed every year. It was always exciting looking forward to a new logo which more often than not, hit the mark. See the SuperBowl XLVII Logo and the SuperBowl XLVI Logo. The New Orleans Hornets are a professional basketball team based in New Orleans, Louisiana. They play in the Southwest Division of the Western Conference of the National Basketball Association. The franchise began play during the 1988€“89 NBA season as the Charlotte Hornets, based in Charlotte, North Carolina, where they were located for fourteen seasons. Following the 2001€“02 season, the team relocated to New Orleans, becoming the New Orleans Hornets In January 2013, the Hornets announced that they would change their name to the New Orleans Pelicans from the 2013-14 NBA season. The new name is taken from Louisiana's state bird, the Brown Pelican. With the new name also came a new logo - a menacing pelican holding a basketball in a blue, gold and red color scheme. The font of the city "New Orleans" is the same as the font found on the street signs of the French Quarter, a famous part of this great city. The crescent is also an important symbol of the city because the city was called the "Crescent City" back in 1835. The city is located on a semi circle bend of the Mississippi river. The color blue is associated with the state, gold with the city and red just adds a good mix. After moving from Charlotte and being displaced for a while, the team may have lost its identify. In order to give the team its identity back, the new logo and name change is warranted and I feel is a good change for the team. The logo is nice and colorful, identifies well with the state and city and certainly a step up from the currently boring white and teal colors of the Hornets. The team has a future superstar in Anthony Davis, who may be a long term player for them. Having his era start with a new branding is a step in the right direction and may be the dawn of a championship winning team. We were not done with our New Year's wishes, when we were confronted with the news that my 14 year old cousin had died from head injuries resulting from a bike accident in India. 14 years old, alive and bubbly one day and gone the next. Could a helmet have saved his life? Probably yes. One of my pet peeves is around the use of seat belts and helmets. There are so many people I come across every day who are so callous about their use (or non-use) of seat belts and helmets, its quite shameful. One of my earliest memories was the death of a friend, who died from head injuries at 18. The image of a dead body covered in a white cloth with blood stains on the head is an image that still gives me the goodbumps. The bottom line is that seat belts and helmets save lives and I was fortunate enough to have first-hand experience where a seat belt saved my father's life. In 1990, there was a plane crash of an Airbus A320 in Bangalore, when an Indian Airlines flight crashed into a swamp just as it approached the runway. The plane caught fire and roughly 100 of the 130 people on board died. My father was on that flight and survived that crash. Yes, he was able to live only because of this little thing called the Seat Belt. The seat belt saved his life and he only got bruised because he hit hit face and legs with the seat in-front. He went on to live a normal life for another 8 years before he passed away. 8 years that made a huge difference to our family and 8 years that I am very thankful for. This is such a common trend in India where many people remove their seat belts seconds after the plane touches the ground. This is one of the most dangerous times because if the plane hits the brakes, you will get tossed. Also, where are you going? Can you not wait till the plane stops? Is the seat belt so uncomfortable? 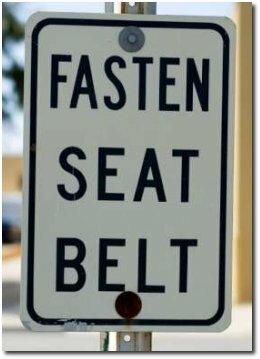 Another trend is to remove the seat belt the moment the "Wear Seat Belts" sign is taken off. There are cases where the plane can hit air pockets and drop several meters if if you are not wearing your belts, you can get tossed up and hit your head among other things. Another common practice is for people sitting in the back seat not to wear seats. I don't understand why? I often get asked "Does that law in your state require you to wear a seat belt at the back?". If there is an accident at 70 miles an hour, everyone is in equal danger whether you are in the front or back. The same with helmets, if you are riding at the back, wear a helmet. Not wearing helmets or seat belts for short distances. Many people think, "Oh, I am just going to the next street...what can happen"? .....well you never know. If you are still not convinced, take a look at this video and do it for the ones who care for you. If this does not move you and convince you to wear a seat belt then probably not will. If reading this article helps you change you mind and wear a seat belt or helmet, I would feel like I made a difference. Please do wear your seat belt and helmets at all times. If not for yourself, do it for the ones who love you. Wearing your seat belt or helmet is one thing you can control while getting into a vehicle.